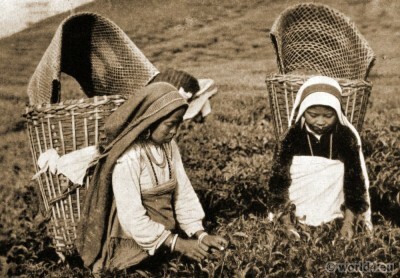 Nepali cooly girls at Darjeeling tea field, c.1910. Home » Nepali cooly girls at Darjeeling tea field, c.1910. Traditional Nepali Cooly Girls costumes c.1910. Source: Views of Darjeeling: With typical native portraits and groups by J. Burlington Smith. This entry was posted in 10s, 20th Century, Asia, India, Nepal and tagged Traditional India costumes, Traditional Nepal Costume on 10/12/14 by world4.